As you can see from this projection, 8 14 12 2 4 6 10 is the Dowker Notation for my knot. 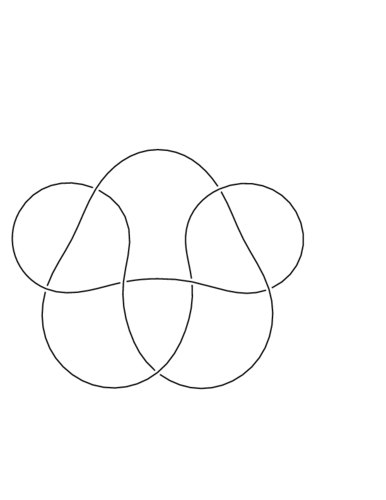 Here is a projection of my knot drawn straight from the Conway Notation. Through different Reidemeister moves you can tell that it is the same knot. Here is a signed planar graph created from my knot. After shading the knot in a checkerboard style and placing a vertex in each shaded part, I connected the verticies through the crossings and then determined the signs. Here is a picture of my knot drawn from closing the braid given by the braid notation. As you can see by this projection my knot is alternating. 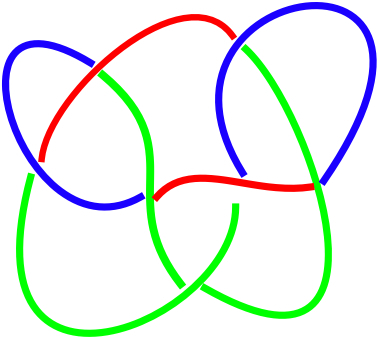 This is a tricolorable projection of the knot. It is not all the same color and all crossings either have all three colors or are all one color. Therefore the knot must be tricolorable. 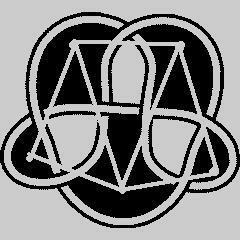 Because my knot is an alternating knot with an odd number of crossings it is not amphicheiral. Also, when we replace each l in the HOMFLY polynomial with an l-1 we do not get the same equation which means that the knot is not equal to it's mirror image and thus is not amphicheiral. 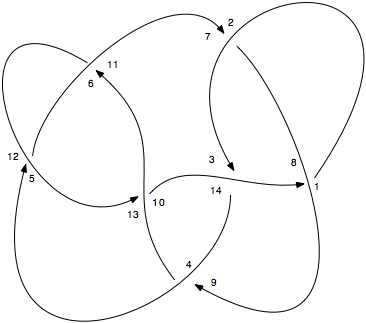 By changing the circled crossing the knot can be untwisted through a variety of R-moves and made into the unknot. As you can see by the pictures, the top strands can be untangled to form two strands that cross over the bottom strands (when they too are untangled) and form two maximal crossings and therefore my knot is a 2-bridge knot. 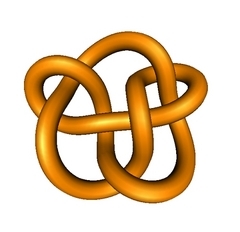 Also, simply because it is a rational knot we can say it is a two-bridge. As you can see from the projection of the knot, the crossing number is 7. Genus is given by g=(#of crossings-#of seifert surfaces+1)/2. By orienting the knot and then eliminating the crossings, we can determine how many seifert surfaces there are. The picture gives us that there are four seifert surfaces (the four discs outlined in different colors) so we can say the genus is 2 because the Genus, g=(c-s+1)/2.